Core support for the Cocoa Research Centre to conserve, characterise and utilise the germplasm held in the International Cocoa Genebank, Trinidad. The UK industry, through BCCCA and CRA Ltd, have been supporting the safe distribution of cocoa germplasm via the quarantine facility at the University of Reading since 1982. Currently, CRA Ltd and USDA are jointly supporting the ICQC,R which provides the only international intermediate quarantine service for the safe movement of cocoa germplasm - one of the key ‘building block’ resources for the cocoa research community. A short study by a post-doctoral scientist based at the University of Reading to use a yeast assay to assess the functional behaviour of a range of cacao genes in terms of their ability to act as transporters of Cd. This study will be conducted in collaboration with Prof. Pathmanathan Umaharan of Cocoa Research Centre, UWI, Trinidad (CRC) and will involve the training in Reading of a post-doc from his lab. The outcome of this study will provide additional information on the role of these candidate genes in determining the final concentration of Cd in cacao and will inform future selection of clones with reduced Cd. The London cocoa trade,through CRA Ltd., continues to support this long standing project to collate and disseminate information on cocoa genetic resources which was initiated in 1988 in liaison with IPGRI (now Bioversity International). The ICGD is freely available through its website (www.icgd.reading.ac.uk)and is also distributed on CD-ROM to cocoa research institutes and others with an interest in cacao genetic resources, and has become a key resource for the cocoa research community. The project is currently funded by ICE Cocoa Futures Europe and is administered by CRA Ltd. This project sets out to gain a better understanding of Verticillium wilt and how it can managed in the cocoa growing area in DR Congo (DRC) and Uganda. A PhD student will be developing methods to detect the pathogen and assess its distribution and genetic diversity. The project is largely supported by the University of Aberdeen and Esco with a contribution from CRUK. In-kind support towards the INCOCOA groups, including INGENIC, for the development of the website and virtual library and occasional financial support towards events including workshops and activities such as publications to disseminate research findings to the cocoa community. The London cocoa trade,through CRA Ltd., continues to support this long standing project to collate and disseminate information on cocoa genetic resources which was initiated in 1988 in liaison with IPGRI (now Bioversity International). The ICGD is freely available through its website (www.icgd.reading.ac.uk)and is also distributed on CD-ROM to cocoa research institutes and others with an interest in cacao genetic resources, and has become a key resource for the cocoa research community. The project is currently funded by ICE Futures Europe and is administered by CRA Ltd.
Mabang Megakarya Selection Programme (MMSP) - Consolidation Phase. The supply of improved planting materials to farmers is a vital component in ensuring the sustainability of cocoa production. A public/private partnership between Ghana Cocoa Board (COCOBOD), Embassy of the Kingdom of the Netherlands to Ghana, GCGRA and its sister organisation CR(UK) Ltd, Mars and Mondelez International contributed over €4million to the continuation of a major breeding programme, the Mabang Megakarya Selection Programme (MMSP) over four years. MMSP’s work will lead to Ghana’s seed gardens supplying farmers with new varieties which have been tested for their performance in an area affected by the devastating Megakarya form of Black Pod disease. In the longer term it will also develop improved clonal varieties which will be at the heart of the modernisation of cocoa production. The supply of improved planting materials to farmers is a vital component in ensuring the sustainability of cocoa production. A public/private partnership between Ghana Cocoa Board (COCOBOD), Embassy of the Kingdom of the Netherlands to Ghana, GCGRA and its sister organisation CR(UK) Ltd, Mars and Mondelez International will contribute over €4million to the continuation of a major breeding programme, the Mabang Megakarya Selection Programme (MMSP) over four years. MMSP’s work will lead to Ghana’s seed gardens supplying farmers with new varieties which have been tested for their performance in an area affected by the devastating Megakarya form of Black Pod disease. In the longer term it will also develop improved clonal varieties which will be at the heart of the modernisation of cocoa production. The London cocoa trade, through CRA Ltd., continues to support this long standing project to collate and disseminate information on cocoa genetic resources which was initiated in 1988 in liaison with IPGRI (now Bioversity International). The ICGD is freely available through its website (www.icgd.reading.ac.uk)and is also distributed on CD-ROM to cocoa research institutes and others with an interest in cacao genetic resources, and has become a key resource for the cocoa research community. The project is currently funded by ICE Futures Europe and is administered by CRA Ltd. The London cocoa trade (NYSE -LIFFE), through CRA Ltd., continued to support this long standing project to collate and disseminate information on cocoa genetic resources which was initiated in 1988 in liaison with IPGRI (now Bioversity International). The project aims to support the continuing breeding and conservation efforts by facilitating access to information on the origins, current location, characteristics of cocoa genetic resources. Although the ICGD is now primarily an online database, providing greater accessibility and allowing more rapid dissemination of new information, a CD-ROM version is available and is especially useful in areas with slow or unreliable internet access. Over 160 copies of ICGD 2012 (released in May 2012), were distributed to over 100 locations around the globe, and were also freely available at the 17th International Cocoa Research Conference (ICRC) in Cameroon (October 2012). Data has continued to be added to ICGD from a wide variety of sources, such as journal articles and conference proceedings, as well as data supplied directly from research institutes. User feedback has driven the continued development of ICGD, resulting in several new features being implemented that improve the search routines and the way in which data is presented. The Genetic Resource Evaluation and Selection Tool (GRest) has also been developed to work alongside ICGD. It impartially and unambiguously ranks accessions, based on information on the traits possessed by individuals and the genetic diversity they represent, allowing selection criteria to be based on specific local requirements. GRest is available on both the online and CD versions of ICGD. As the principle resource for cocoa germplasm information, ICGD has a central role outlined in ‘A Global Strategy for the Conservation and Use of Cacao Genetic Resources, as the Foundation for a Sustainable Cocoa Economy’, recently published by CacaoNet (the global network for cacao genetic resources). Two presentations about ICGD, the data it contains, and how it fits in the Global Strategy for the Conservation and Use of Cacao Genetic Resources, were presented at the 17th International Cocoa Research Conference (ICRC) organised by COPAL. An overview of the GRest program was also presented at the INGENIC workshop that followed the Conference. Supply of High Quality Cocoa Seeds to Ghanaian Cocoa Farmers. A joint project with CRIG to analyse and interpret historic and more recent data from CRIG's breeding programme with a view to selecting types for further evaluation in seed garden and MMSP trials. A research project in Ghana to test whether the leaf disc and/or detached pod tests for black pod resistance can be used to predict the rank order of disease incidence of the 16 clones in a completed clone trial and of the general combining abilities (gcas) of 5 and 10 parents in two completed field trials. The London cocoa trade, NYSE-LIFFE, continues to support this long standing project to collate and disseminate information on cocoa genetic resources which was initiated in 1988 in liaison with IPGRI (now Bioversity International). The ICGD is freely available through its website and is also distributed on CD-ROM to cocoa research institutes and others with an interest in cacao genetic resources, and has become a key resource for the cocoa research community. The project is currently funded by NYSE LIFFE and is administered by CRA Ltd. In this phase of the project, the ICGD was re-structured to a MYSQL/PHP platform to facilitate updating and improve data accessibility.Data on half-sibs and genetic groups has been added and the way the ICGD deals with synonyms has been improved to allow users to use the clone names that they are most familiar with. Development of a tool to allow ranking of accessions based on characteristics including genetic diversity has continued. The field guide "A Visual Aid to Identifying Widely Distributed Cacao Accessions’ was published using data from the ICGD as part of the CFC/Bioversity Cocoa Genetic Resources project. A co-funded project with the Government of the Netherlands to carry out a major re-propagation programme and install reservoirs and an irrigation system to improve the security of germplasm held in the International Cocoa Genebank, Trinidad. Support towards meetings and other activities associated with the development of a global strategy for the conservation and use of cacao genetic resources. Co-financed activities as part of ‘Cocoa Productivity and Quality Improvement: a Participatory Approach’ (CFC/ICCO/IPGRI/Bioversity). Co-financing and counterpart funding for activities at Cocoa Research Unit (Trinidad) and the Univ. of Reading which formed part of this global project which involved 14 institutions in West Africa, the Americas, SE Asia and Europe. A short project to collate genetic fingerprinting data from various sources and, in collaboration with scientists at USDA, CIRAD and Mars, to carry out an analysis to prioritise the accessions to conserve in the CacaoNet Global Strategic collection. Securing a Sustainable Future for the International Cocoa Quarantine Centre through the Installation of Energy Saving Measures. A jointly funded project with the Government of the Netherlands (Sustainable Cocoa Subsidy Scheme) to install energy saving thermal screens and refurbish the quarantine facilities. These measures have resulted in an energy saving of some 40% compared to previous years. The thermal screens also permit better shade/humidity control and result in improved plant growth. Mabang Megakarya Selection Programme (MMSP). A major new breeding programme with the objective of new planting materials with high yield in the presence of damaging pests and diseases, and which can deliver fermented and dried cocoa beans of traditional Ghanaian quality. A research placement for an undergraduate studentship for a student from University of Bath at the Cocoa Research Unit, Trinidad. The project involved determing the factors affecting conversion of wet weight to dry weight in cocoa, as well as training in vegetative propagation, small scale fermentationa and flavour evaluation techniques. The London cocoa trade, through BCCCA/CRA Ltd., continues to support this long standing project to collate and disseminate information on cocoa genetic resources which was initiated in 1988 in liaison with IPGRI (now Bioversity International). The ICGD is freely available through its website and is also distributed on CD-ROM to cocoa research institutes and others with an interest in cacao genetic resources, and has become a key resource for the cocoa research community. The project is currently funded by NYSE LIFFE and is administered by CRA Ltd.
A short project to study the genetic diversity and structure of wild cacao populations using microsatellite markers. A post-doctoral research project to investigate the genetic diversity of 17 georeferenced wild cocoa populations using a novel approach to select microsatellite markers. Assessment of the Genetic Fidelity of Somatic Embryo-derived Cocoa. A PhD research project which set out to examine variation at the genetic level in somatic embryos produced using a tissue culture technique. This project constituted the first large-scale molecular characterisation of changes that occur during primary and secondary somatic embryogenesis in cocoa. The novel techniques developed during the project allow a rapid assessment of variation at both genetic and epi-genetic levels. The effects of time in culture, embryo origin, and genotype on somaclonal variation were assessed and this enabled recommendations to be made on the most appropriate procedures to reduce the risk of mutation/variation in somatic embryo production. Intensive Genetic Characterisation of Diverse Cocoa Germplasm. A post-graduate research project to develop a new genetic fingerprinting technique based on ISSR-PCR which could be used to distinguish large numbers of closely related accessions and link genetic markers with traits of interest to breeders. Co-financing and counterpart funding for activities at Cocoa Research Unit (Trinidad) and the Univ. of Reading, which formed part of this global project which involved 11 institutions from West Africa, the Americas, SE Asia and Europe. Farmer Based Elite Germplasm Identification and Multiplication in Côte d'Ivoire and Ghana. A two year research project which established somatic embryogenesis technology at both CNRA and CRIG and used this to propagate promising selections which had been identified by farmers. Combined Fingerprinting and Tagging in Cocoa. The main objective of this project was to fingerprint all material held in the Reading Intermediate Quarantine Collection and to generate a SNP-based marker system that is fully transferable, related to target genes, and could be applied with minimal equipment. The programme of work was adjusted to take account of a USDA initiated programme to use the microsatellites generated at CIRAD to fingerprint Germplasm collections in the Americas. Allelic standards were created for each locus to replace the generic standards previously used to ensure transferability of results between laboratories. A total of 89 SNPs were identified across divergent material and these generated 39 CAPS markers across 30 loci. Some of these markers were used to screen large numbers of genotypes. The London cocoa trade, through BCCCA/CRA Ltd., continues to support this long standing project to collate and disseminate information on cocoa genetic resources which was initiated in 1988 in liaison with IPGRI (now Bioversity International). The ICGD is freely available through its website and is also distributed on CD-ROM to cocoa research institutes and others with an interest in cacao genetic resources, and has become a key resource for the cocoa research community. During this phase of the project ICGD Online (www.icgd.rdg.ac.uk) has been considerably improved with the inclusion of new links to view photographs, full references, research station addresses and information on the origins of group names. New pages have been added that allow microsatellite data to be viewed and compared (currently exact matches and possible parents). The project is currently funded by NYSE LIFFE and is administered by CRA Ltd. Collecting and Genetic Fingerprinting of Guyana Cocoa Material Using ISSR-PCR. A short project to study the levels of genetic diversity present in material collected by the Guyana Cocoa Initiative from uncultivated sources and also to genetically fingerprint the materials held in the Timehri Genebank. This long standing project to collate and disseminate information on cocoa genetic resources was initiated in 1988 in liaison with IPGRI (now Bioversity International) and is supported by the London cocoa trade. The ICGD is freely available in computerised and printed formats to cocoa research institutes and others with an interest in cacao genetic resources. It has become a key resource for the cocoa research community and is currently funded by NYSE LIFFE and is administered by CRA Ltd.
Support to allow students to participate in summer expeditions to collect wild cocoa material in Guyana and establish it in the National Genebank at Timehri. An associated genetic fingerprinting study showed that some of the material collected was very different to most other accessions held in international genebanks. BCCCA used to provide support for a greenhouse facility in Barbados to quarantine materials entering the ICG,T. Since 1998 this function has been undertaken by the International Cocoa Quarantine Centre, University of Reading. A short project to evaluate the potential of the Inter-Simple Sequence Repeat (ISSR)-PCR technique to assess levels of homozygosity/heterozygosity in cocoa germplasm. A short project to evaluate the potential of the Inter-Simple Sequence Repeat (ISSR)-PCR technique for the genetic characterisation of cocoa germplasm. A short project to photograph the accessions in the BAL Plantations collection for inclusion in the ICGD. In 1994, the London cocoa trade agreed that its contributions to the BCCCA research programme should be used to support the International Cocoa Germplasm Database project which had been initiated in 1988 to collate and disseminate information on cocoa genetic resources in liaison with IPGRI (now Bioversity International). 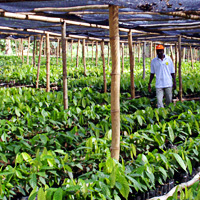 The ICGD was distributed in computerised form to cocoa research institutes and others with an interest in cacao genetic resources, and has become a key resource for the cocoa research community. [The project has continued and is currently funded by NYSE LIFFE and is administered by CRA Ltd]. The London cocoa trade, through BCCCA/CRA Ltd., continued to support this long standing project to collate and disseminate information on cocoa genetic resources. In this phase of the project, a second MS-DOS version of the ICGD was distributed widely to cocoa research institutes and others with an interest in cacao genetic resources. The project has continued to develop and is now a key resource for the cocoa research community, funded by NYSE LIFFE and administered by CRA Ltd. The International Cocoa Germplasm Database project continued to collate and disseminate information on cocoa genetic resources and establish itself as a key resource for those interested in cocoa breeding and genetic resources. It continued to build links with the cocoa genebanks and research institutes who contributed the data on the characteristics of their accessions and developed software to help make this information more easily accessible. The project has continued and is currently funded by NYSE LIFFE and is administered by CRA Ltd. Primitive Cocoa Germplasm Database (ICGD) 1990-1991. In the third year of this long standing project to collate and disseminate information on cocoa genetic resources, a printed version of the database was released to cocoa research institutes and others with an interest in cacao genetic resources. The database became known as the International Cocoa Germplasm Database and further information on the origins, current locations and characteristics of cocoa clones was collated into a computerised database in collaboration with cocoa research institutes, universities and individuals working in the area of cocoa genetic resources. The project has continued and is currently funded by NYSE LIFFE and is administered by CRA Ltd. This was an extension to a pilot project to collate and disseminate information on cocoa genetic resources in liaison with IPGRI (now Bioversity International). The database of Primitive Cocoa Germplasm was expanded to include selected material and data on clone characteristics. The project has continued to develop and is currently funded by NYSE LIFFE and is administered by CRA Ltd.
Dr.M.T. Jackson of University of Birmingham visited Peru and held preliminary discussions with INIAA to assess the possibility of organising a collecting expedition to the Loreto and Madre de Dios regions of Peru. It was noted that the upcoming elections (1990) and a change of government could affect INIAA and the security situation. This was a pilot project to collate information on cocoa genetic resources with a view to making the information more widely available to the cocoa research community. The first output from the project, released as ‘The Catalogue of Primitive Cocoa Germplasm’ in 1989, was distributed in computerised form to cocoa research institutes and others with an interest in cacao genetic resources. It contained information on the origins and current distribution of cocoa germplasm collected from the wild since 1938. The objective of the Project is "to develop an economic management system to control witches' broom disease of cocoa in a number of cocoa growing environments"
The initial project to transfer the Kew Cocoa Quarantine Collection to the University of Reading and establish a new quarantine service to ensure the safe movement of cocoa germplasm around the world - one of the key ‘building block’ resources for the cocoa research community. Danquah, O-A (1986) Growth of Crinipellis perniciosa in cocoa resistant and susceptible to witches' broom. PhD Thesis, Imperial College, University of London The growth of two isolates representative of the two pathotype populations on cultivated cocoa of Crinipellis perniciosa, the causal agent of witches’ broom was studied in seedlings with Scavine 6 as one parent. One isolate from Pichilingue in Ecuador (pathotype A) induced significantly more hypertrophy, grew more rapidly up the plant and colonised the tuees at any one level more extensively than did the other isolate from Trinidad (pathotype 8). For both isolates·there were highly significant correlations between amounts of fungus in the tissues and the hypertrophy produced but no indication that they differed in their ability to induce hypertrophy. In seedlings infected with the Trinidad isolate, groups of necrotic cells associated with the intercellular hyphae of C. perniciosa were found 5 weeks after inoculation. Similar sites of necrosis developed more slowly and less frequently in seedlings infected with the Pichilingue isolate. Thus at 9 to 12 weeks after inoculation, there were significantly more sites of necrosis and more necrotic cells per site in seedlings infected with the Trinidad isolate and more unaffected hyphae in seedlings infected with the Pichilingue isolate. When basidiospores of the two isolates were germinated in water extracts from Scavina 6 seedlings, the germ-tubes of the Pichilingue isolate were significantly longer than those of the Trinidad isolate. This different in germ-tube growth appeared to be associated with the phenolic and alkaloid components. However, no significant correlation was obtained between the numbers of hyphal fragments in Scavina 6 seedlings and germ-tube length in extracts of tissue from the same seedlings. Similar studies of the two isolates in seedling of other cocoa cultivars further indicated the ability of the Pichilingue isolate to grown in those with Scavina parentage though in others eg Amelonado, both isolats grew equally well. Further tests with extracts of other cocoa cultivars were inconsistent and inconclusive. An attempt was made to study the significance of cell death in the C.perniciosa/ccoa relationship by preparing cocoa callus and cell suspensions, but the techniques used were not entirely successful. "Improved planting material is a vital component of sustainable cocoa production"